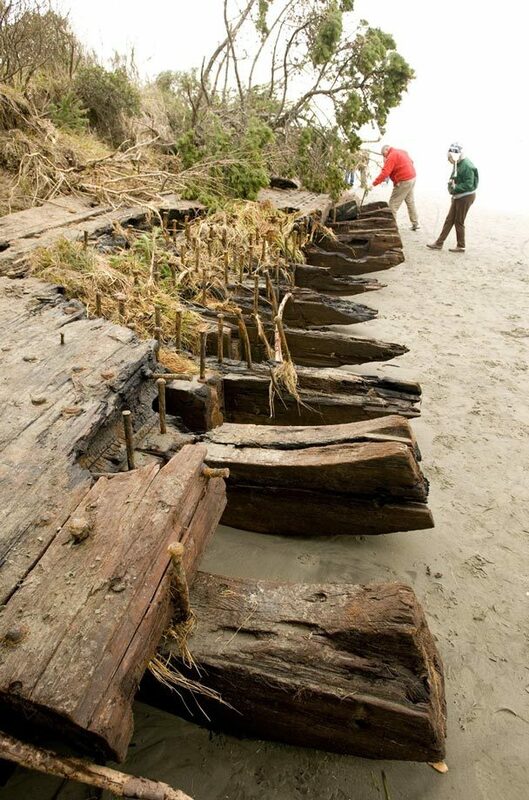 As recently as a year ago this shipwreck was buried under 9 feet of earth and trees on Washaway Beach along the Pacific Coast in Washington state. 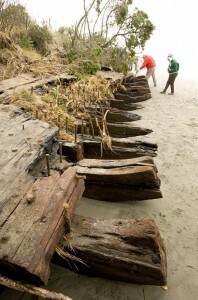 Now erosion has revealed the 125 foot-long skeleton of a shipwreck. A week and a half ago the keel peeked out, then the shifting coastline exposed more and more of the ship’s structure. According to maritime experts and others, the wreckage could be part of the Canadian Exporter, a freighter that broke in two in August 1921 while carrying 3 million board feet of lumber and 200 tons of general cargo, as noted in a contemporary issue of American Shipping magazine. If so, the remains could belong to whoever bought salvage rights, or to a private landowner, or to the state. “As near as I can tell, it’s on state land,” said Pacific County Assessor Bruce Walker, who visited the site over the weekend. If ownership cannot be determined, the wreckage could become a salvageable piece of history. But even as the Assessor’s Office tries to sort that out, the worst fears of museum officials and maritime buffs are being realized as scavengers reap the sea’s rewards on their terms, stripping the remains for usable or sellable scrap. Yes charming. If you’re going to “recover” bits of it, could you at least give a tiny crap about its historical value instead of selling it for scrap? Unfortunately, Washington’s Department of Archaeology and Historic Preservation doesn’t have the authority to excavate, nor does the local Westport museum. Nobody does until ownership is established. I suppose the locals are somewhat jaded. That stretch of the Pacific Coast has taken down of dozens of ships. It’s also one of the fastest eroding coastlines in the world, so people are always stumbling on remains. 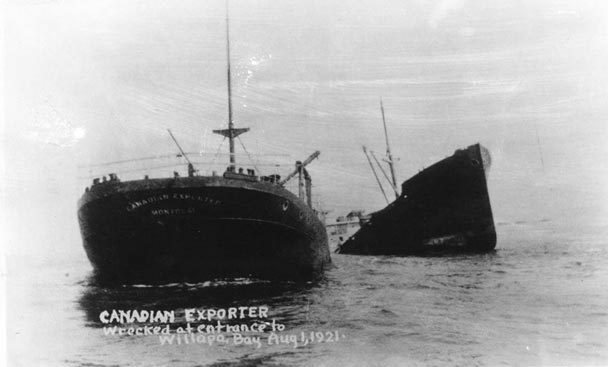 The Canadian Exporter is just one of many ships to succumb to the sandbars and fog the entrance to Willapa Harbor. The crew were all rescued when the ship ran aground, but they couldn’t do anything but watch as the pressure from the waves broke the ship in two. Twenty and forty-foot timbers have turned up before, matching the Exporter’s cargo. Identifying marks on the wreck also match the Exporter’s cargo manifest.